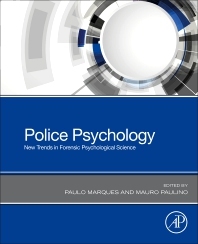 Police Psychology: New Trends in Forensic Psychological Science is a relatively new specialty that falls under the umbrella of forensic psychology. Today, it is broadly defined as the application of psychological principles and methods to law enforcement. This publication aims to bring together the contributions of some of the most prolific authors in the field to bridge the gap between the knowledge base of researchers, practitioners and policymakers regarding the interface of psychological sciences and law enforcement. Paulo Barbosa Marques is a criminal investigator at the Criminal Investigation Department of the Public Security Police (PSP). He graduated in Psychology and is a chartered forensic psychologist with expertise in forensic psychological assessment. He also holds a Masters degree in Law and Security from the Faculty of Law - NOVA University of Lisbon and a postgraduate course in Internal Security from the Higher Institute of Police Sciences and Internal Security. Mauro Paulino is currently a coordinator at Mind, Institute of Clinical and Forensic Psychology (Lisbon, Portugal). He is also a forensic psychologist consultant at the Instituto Nacional de Medicina Legal e Ciências Forenses, I.P. (Gabinete Médico-Legal e Forense Península Setúbal) and a Clinical Director of Pelo Sonho - Cooperativa de Solidariedade Social, supervising shelter and care center for victims of spousal violence. Mauro received his Master degree in Legal Medicine and Forensic Sciences at the University of Lisbon, School of Medicine completing his research in the field of spousal violence. He is an author and coordinator of several books and is a guest lecturer at various national and international universities and training session on spousal violence.